I’m gradually building up quite a large library of Antarctica literature, science and photography books, but my most recent acquisition is easily amongst the best. 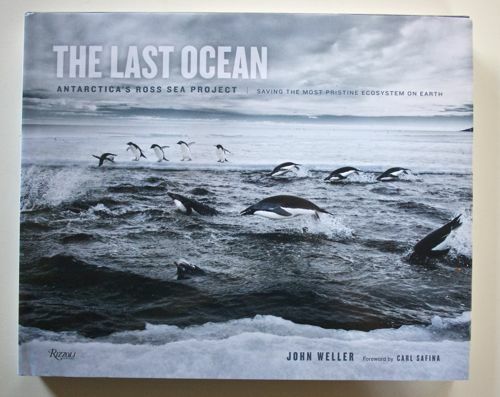 “The Last Ocean - Antarctica’s Ross Sea Project”, by John Weller, caught my eye in a fairly highbrow Art bookshop, the sort that usually only stocks books with blurry, grim, preferably black & white photos. Certainly nothing as common as nature photography. But The Last Ocean _is_ nature photography. Actually, it is extremely good nature photography, possibly the best contemporary Antarctic photography I’ve ever seen. John Weller’s photography is restrained, giving the land, the sea, and its native inhabitants space to breathe. Unlike so much other work, these photographs are about their subject, not about where the photographer has been or how hard he/she can push the saturation slider. They are sometimes dramatic, but it’s never forced. This photography draws you in and captivates you. It doesn’t make you go “Wow! Great Capture! You must have a great camera!”, but rather it demands that you linger and let you eyes explore. It’s meditative, subtle and thoroughly gorgeous. But that’s not the end of The Last Ocean by any means. Photography is only half the story. The book is full of excellent, reflective essays on the Ross Sea ecosystem, and anecdotes about making the photographs. In fact I found that I had to read the book twice, once for the essays, and once for the photos. And then I read it again, twice. The essays are not of the clingy, preachy, hand-wringing variety one might fear, but rather are informative, scientifically literate and very readable. The Last Ocean is associated with the wider Ross Sea Project, a voluntary organisation started in 2004 to promote the establishment of a marine protected area (MPA) in order to conserve the pristine qualities of the Ross Sea, Antarctica. There’s also a film. But start with the book. You won’t regret it. And if you happen to browsing Orell Füssli’s art book section in Zürich, watch out, they may still have some copies. They’re near the blurry, grainy black & white naked ladies books.